In recent weeks, we’ve talked a good bit about MACRA/MIPS reporting requirements, as well as how your practice can automate and improve reporting results and the workflows around them. This year, healthcare providers participating in MIPS are required to report on at least six measures, which will account for 50 percent of final MIPS scores. We’ve explored two of these measures so far in our series: Measure 117 – Diabetes Eye Exam and Measure 112 – Breast Cancer Screening. This week, we’re taking a look at a more common measure: Measure 236: Controlling High Blood Pressure. While the other two measures we recently discussed are certainly important ones, Measure #236 – Controlling High Blood Pressure is a much more common one — as nearly 30% of Americans have hypertension — and is considered by CMS to be a high priority. This measure is to be submitted a minimum of once per performance period for patients with hypertension seen during the performance period. The performance period for this measure is 12 months. The most recent quality code submitted will be used for performance calculation. This measure may be submitted by eligible clinicians who perform the quality actions described in the measure based on the services provided and the measure-specific denominator coding. With our existing integration to your EHR/EMR, we can filter the ages given. For this measure, we’ll begin our list with only patients who are 18-85 years of age. Next, we need to narrow the list down to those patients who have had the diagnosis of I10 for hypertension and/or CPT codes 99201, 99202, 99203, 99204, 99205, 99212, 99213, 99214, 99215, 99341, 99342, 99343, 99344, 99345, 99347, 99348, 99349, 99350, G0402, G0438, G0439. 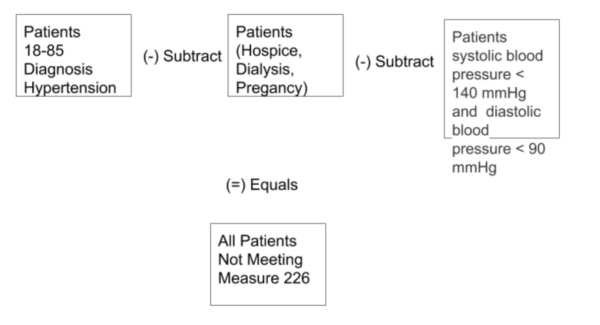 We can create another list of patients who have had G9740 hospice care, end stage renal disease (ESRD), dialysis, renal transplant before or during the measurement period or pregnancy during the measurement period: G9231, and subtract them. Finally, the last step is to build a list of all patients whose most recent systolic blood pressure is below 140 mmHg and whose most recent diastolic blood pressure is less than 90 mmHg, and subtract them from the main list. This tool is exceptionally helpful for easily finding all of your high blood pressure patients who have not met the criteria of <140/90mmHG blood pressure reading during the measurement period. Assuming this data is documented in your EMR/EHR in a repeatable, standard way, we can use almost any field to create, monitor, and help improve these measures. Then, you can create automated actions, such as alerting patients, providers, and/or staff to focus on improving this measure. create an automated Care Coordination campaign to improve patient outcomes and ultimately your final score. Using the list of patients you generated, you can then automatically trigger appointment requests and/or recalls to be delivered to patients who aren’t currently meeting this particular measure. What’s more? You can even send reminders to these patients to take medications, exercise, or do other activities that will help control their blood pressure. In addition, you can ensure your staff knows to schedule and/or follow up with these patients at their next appointments to see if each of them are improving and/or meeting the measure. Healthcare regulations aren’t getting any simpler. But with the right tools, like Vital Interaction™ Care Coordination, you can get a leg up on requirements by automating the reporting process and improving your overall score.